Kratom Red Vein is a variety of the Thai Kratom tree Mitragyna speciosa (synonym: Mitragyna religiosa), a form with reddish veins - hence the suffix Red Vein. Another known form is the Green Vein, which has greenish to whitish veins. Red Vein Kratom is made from the leaves of Thai Kratom trees. Red Vein Kratom is harvested exclusively in Thailand, but the Kratom tree M. speciosa thrives in swampy areas of the South East Asian region, such as Malaysia, Indonesia and New Guinea. In Asia, Mitragyna speciosa is also called Gra-tom, Biak, Biak Biak, Mambog and else, the Thai varieties are divided into the varieties of Red Vein and Green Vein. The Kratom plant belongs, as Mama Coca (Erythroxylum coca), to the coffee, madder or bedstraw family (botanical name: Rubiaceae) and can probably be cultivated outside Asia, but it currently lacks growing reports that tell of the successful cultivation of the tree in the garden or greenhouse. Appropriate field studies should follow in the future. 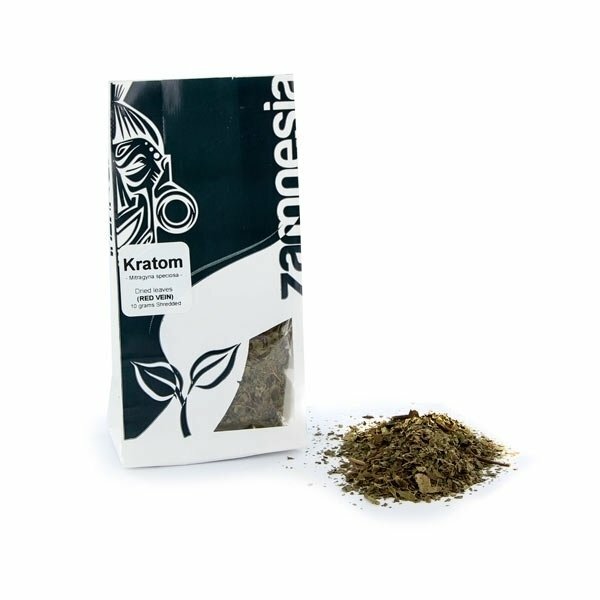 Kratom Red Vein mainly contains the alkaloid mitragynine, which is closely related to the other psychedelic indole derivatives, such as the ergot derivatives, the N, N-DMT and the fungal drugs psilocin/psilocybin. The ingredients mitraphylline isomitraphylline and neatly fit into the category of the alkaloids of the Yohimbine type. Active indoles in Kratom Red Vein are among others: Ajmalicin, Corynanthedin, Isomitraphylline, Mitragynalin, Mitraphylline, Paynanthein, Speciogynin, Speciophylline, Rotundifolin, Rhynchophylline and many more. Kratom Red Vein acts paradoxical - a circumstance which may be difficult to theoretically mediate to inexperienced psychonauts. The impressive: Kratom Red Vein acts in a strongly sedative manner, means calming to soporific and thereby the action profile is comparable to the opiates. At the same time, however, Kratom Red Vein can act stimulating and amphetamine-like, so that the experimentee can in fact undergo both action spectra at the same time. As a rule, the experience of Kratom Red Vein however splits in different "time zones". First Kratom Red Vein will release a more uplifting effect, to move to a much damping mode of action later. As with other Kratom preparations, for Red Vein Kratom the dried, rarely the fresh leaves are used. If dry spreadings are used, the euphoric and stimulant dosage is between one and six grams, the sedative dosage between seven and twelve grams and the strong sedative dosage starts at an amount of 13 grams of dried Kratom. The leaves are used as an aphrodisiac or (more or less) strong inebriant and are either smoked or eaten or drunk. Extracts of the leaves act much stronger than the raw drug itself. Fresh leaves of Kratom Red Vein are rolled into a quid and chewed for hours. 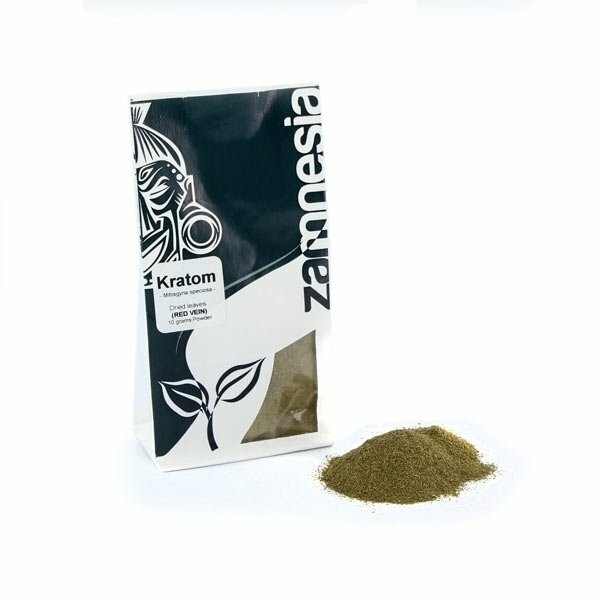 Kratom Red Vein contains the indole alkaloid mitragynine and other ingredients. Particularly the main component mitragynine is a very safe substance with an enormously low toxic potential. Animal testings documented no toxic effects in mice which had been administered up to 920 milligrams of Mitragynine per kilogram of their own weight. Nevertheless, this substance entails its dangers in certain areas. Therefore Mitragynine/Kratom Red Vein should just like any other psychoactive substances and organisms not be considered as toys and always enjoyed with great caution. Kratom Red Vein is currently no subject to regulations. There are however the individual, country-specific drug regulations.